Interior Minister Gilad Erdan revokes permanent Jerusalem residency status of the driver for 2001 Dolphinarium attacks. Interior Minister Gilad Erdan (Likud) has officially cancelled the permanent residency status of a Palestinian terrorist Sunday morning, negating the rights of Mahmoud Nadi, the driver for the suicide bomber responsible for the bombing at the Dolphinarium Disco in Tel Aviv in June 2001. That attack killed 21 people and wounded over 100 others. Nadi was convicted of accomplice to manslaughter, assisting in terror, and assistance to harbor an illegal alien in Israel. He was sentenced to ten years in Israeli prison for the offenses. Erdan wrote to Nadi in making the decision, noting that "under these circumstances and in view of the severity of your actions, [assisting in the attack] is a blatant breach of trust as a resident of the State of Israel and the state." "I decided to use the authority and cancel your permanent residence permits in Israel," Erdan added. Erdan's decision effectively cancels Nadi's registration in the population census, revokes the validity of his teudat zehut identity card, and bars him from all rights and services, including social security and health insurance. Erdan explained his decision as the outcome of the recent waves of terror. 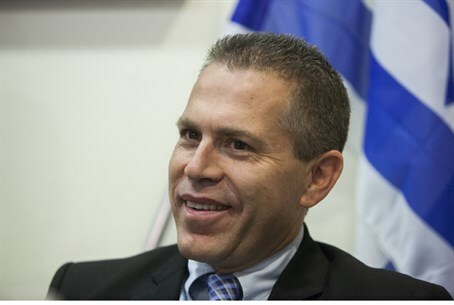 "The State of Israel is currently suffering a wave of terror and incitement," Erdan said. "[Terrorists] are involved in carrying out attacks on the country's citizens, [and] help them and justify them, and incite others to commit crimes and murders." He said, "These people are not able to continue to enjoy the status of permanent residents in the country, and I will work very hard to revoke this residency and deny them any economic benefit reaped from this grant." It comes just one day after the Interior Minister announced that he was examining the possibility of expanding his powers to expel Arab terrorists from Jerusalem, precisely by revoking their residency permits. This is the latest in a series of legal actions to crack down on terrorism since Tuesday's massacre of four Rabbis in Har Nof, Jerusalem. The terrorists, Ghassan and Uday Abu al Jamal, were also permanent residents - and could be the precedent for Erdan's decision. Meanwhile, in an unprecedented move, the Israeli government has reportedly refused to release Ghassan and Uday's bodies as a deterring gesture - the first time that Jerusalem has refused to sponsor the burial of terrorists.